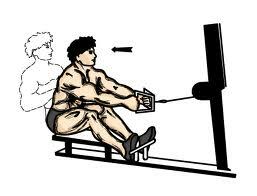 Seated Pulley Rows are a back exercise used to increase the size and strength of your back, biceps, and lats. It is frequently incorporated into routines because the natural movement is low-risk, even at heavy weight. Still, make sure you are not putting too much strain on your neck or back, by keeping the rest of your body at a 90 degree angle to your legs. Keep the motion as fluid as you possibly can, and don’t jerk the weight towards you. Smooth, controlled motions with your shoulders pointing up away from the weights. Make sure your knees are slightly bent, and firmly placed. Get a good rope extension, and attach it to the pulley. Hold your torso to a 90 degree angle to your legs, and pull the handles back toward your torso. Squeeze your shoulder blades together, and pull the cable toward you while breathing in. Use the strength of your back to pull your elbows toward your ribcage. Bring the weights as close to your abs as you can without touching them. Breath out as you slowly let the weight go back to starting position. To switch things up, you can also do one-handed seated pulley rows. This allows you to focus on one arm at a time, is a change of pace, and prevents you from accidentally focusing too much on your more dominant arm. The Miranda Kerr workout featuring the Victoria’s Secret model uses seated rows. She uses them during her weight workouts. On other days, she uses total body circuits designed by her trainer, Justin Gelband. The Mark Wahlberg workout uses seated pulley rows during his back workouts to gain 40 pounds of muscle. The Rock Workout uses seated pulley rows as part of his legs and back exercise to form that V-shape he is famous for. Know anyone that wants a toned, more muscular back? Or, that could benefit from this exercise? I am always searching online for articles about fitness. Thank you! Good information, many many thanks for the author.